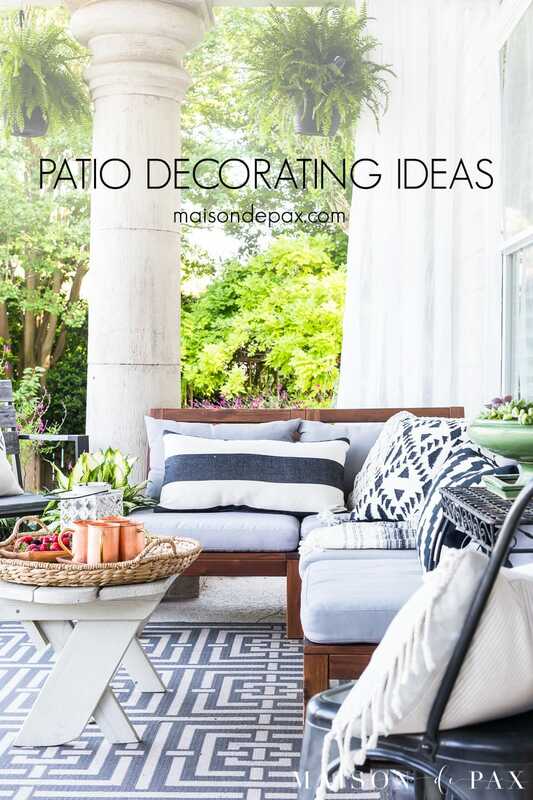 Looking for summer porch decorating ideas? 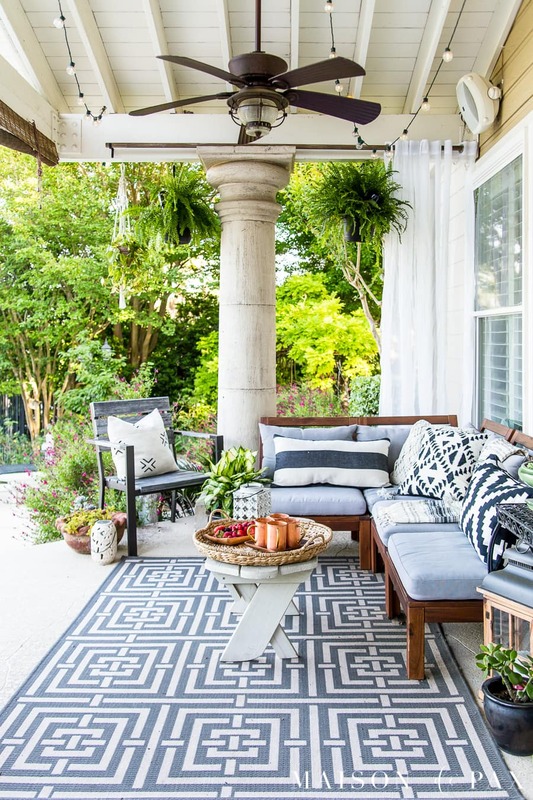 This black and white porch decor with ferns and succulents makes a gorgeous outdoor summer retreat. There are some posts that deserve step-by-step written instructions with 39.5 bullet points and a video demonstration… And then there are those that need nothing more than your favorite drink in hand. You may notice that I updated it from last year with a more neutral color scheme. 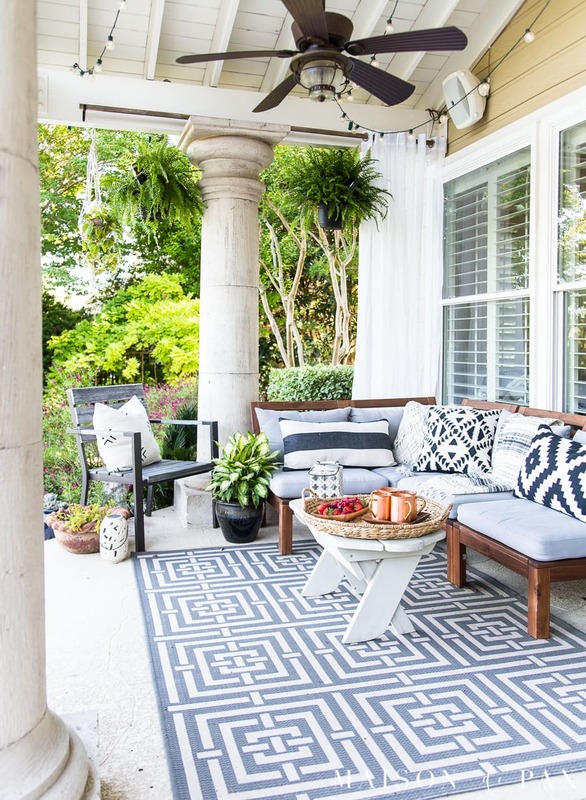 As always, I find outdoor textiles the best way to make a patio feel like another room in the home, so a few new outdoor pillows (and the same outdoor curtains from before, which are SO affordable, by the way!) and I’ve got a whole new look. In hot, dry central Texas, succulents are always a favorite, but I love the texture of ferns, so you can see here how I keep them hydrated through our hot summers. 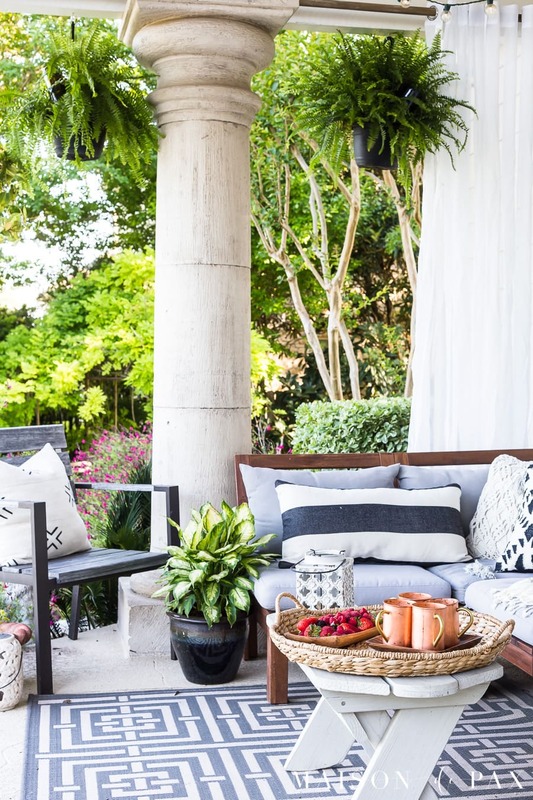 If you love peaceful outdoor spaces as much as I do, don’t forget to pin it! Now for a special treat, I’m continuing the Outdoor Extravaganza organized by my sweet friend Shauna from Satori Design. 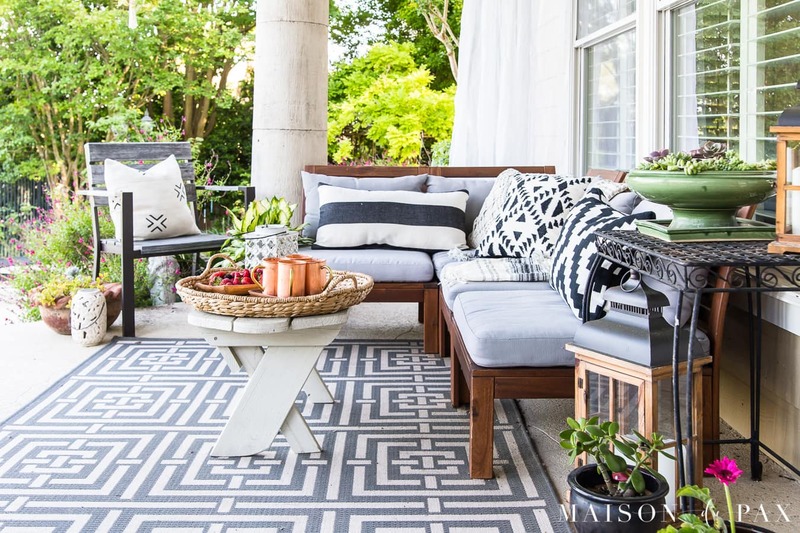 Be sure to visit all the bloggers sharing their outdoor living and entertaining ideas! 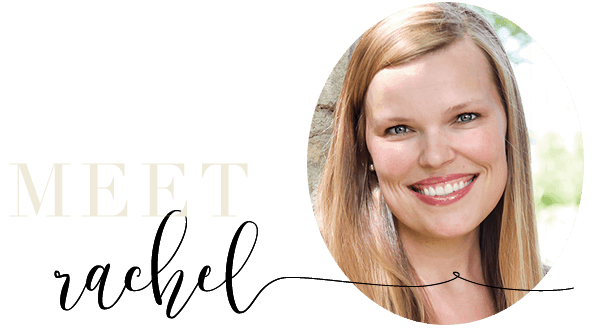 Gorgeous, Rachel! 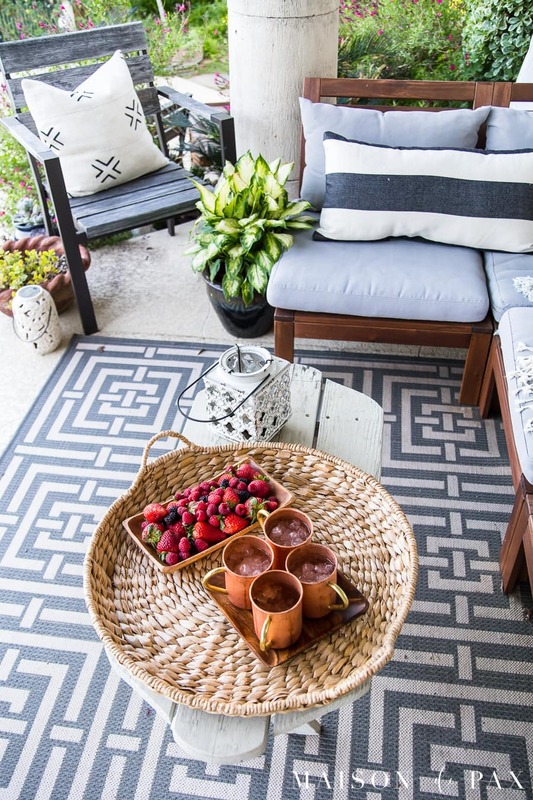 I love calm greenery like ferns and succulents, and your patio is an absolute fave!! Thanks, Krista! I envy your view too! Thanks, Shauna! I try to get out there daily! Gorgeous! What a great space you have and very tastefully decorated. Love all the blue pillows. What a gorgeous space…so beautifully decorated and peaceful! What a beautiful space. It looks so relaxing. You are absolutely correct that it needs no fancy words or bullet points. Just looking at it causes a comfortable feeling. Thank you for sharing. Thank you for your kind words, Audrey! This is so beautiful, the peace and tranquility just comes through while reading this post! 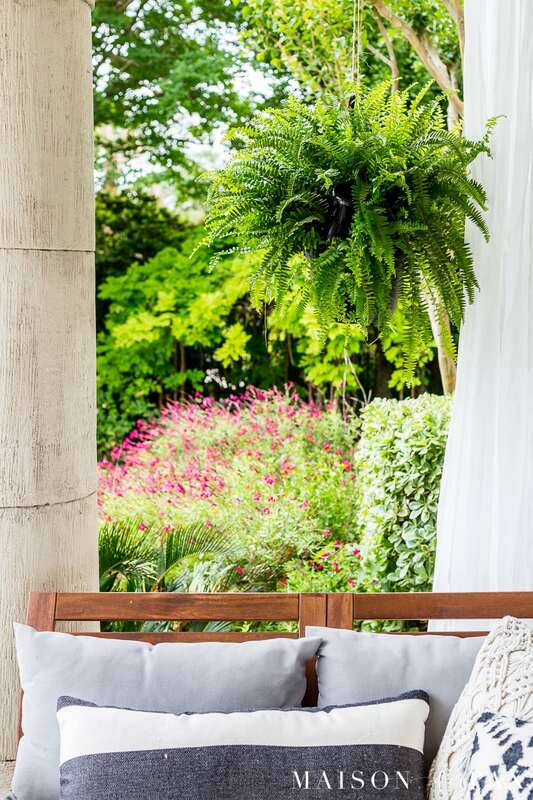 I also love ferns and succulents, just perfect for that beautiful outdoor space! Thank you, Laurie! I hope you can get some new plants for the summer season. Rachel, I love your backyard area! Let’s have wine out there together, okay? Absolutely beautiful Rachel! I just love the black and white pattern against the green plants and copper tray. A gorgeous combination for summer. Thanks, Stephanie! It’s all about the subtle details. Looks like you have a nice place to be for the summer, have fun with your little ones. Thank you, Danielle! It is a lovely family retreat! great for unwinding and reading with my tall glass of ice tea. Ha, Linda! I feel the same way! I wanted to know where you go the cushions for the sectional. Much more interesting than the standard colors that typically come with the furniture. Also, the link for the furniture takes you to an ikea set that has arms at both ends…any tips on where to find what you have? I honestly would like to replicate your beautiful porch exactly! Thanks for sharing! Thank you! I’m so glad you like it! We actually purchased both the sectional and the cushions at IKEA, but they unfortunately seem to have stopped carrying both. 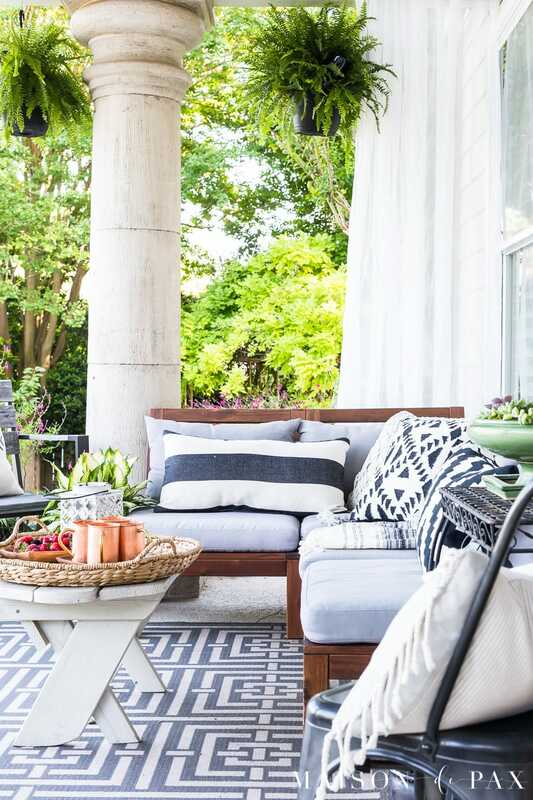 I have been looking for a similar outdoor sofa ever since!